Harry Potter and the Chamber of Secrets has always been my least favorite book in the series, so it’s no surprise that it’s also my least favorite movie. The story just never grabbed me as much as the others. Even the later revelation that what happens here is integral to the overall series has only slightly warmed me to this installment. 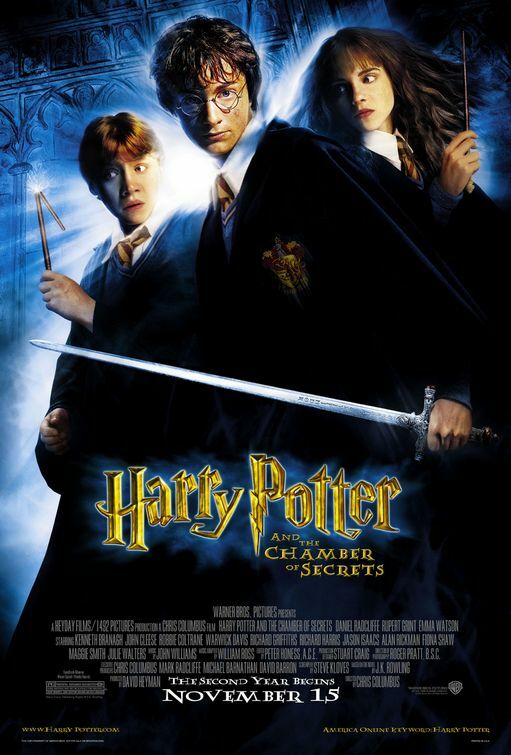 Chamber of Secrets has never really done it for me, and the film does nothing to improve this. Technically speaking, this movie isn’t much different than the first. It too is a rather faithful adaptation of the novel, and successfully translates the change in tone in this story to the screen. While Sorcerer’s Stone was mostly cheerful and happy, this story is darker. The danger presented is more perilous (something is attacking people, ghosts, and animals in Hogwarts, including several students), and it seems less evident that everything will end up OK in the end. The film by extension is less colorful and more serious. Again, all of the key scenes are there, with only a few plot points drastically changed to fit for time and pacing. No, my big complaint with the movie is that it starts the trend of making Ron Weasley look like a complete moron. To be fair, he’s never portrayed as a genius in the books, and he’s definitely not as academically inclined as Hermione. HOWEVER… he was raised in the wizarding world from birth. In the books Ron is the reader’s window into this unfamiliar world. So when the movie Hermione explains to the audience what a “mudblood” is and informs Harry that hearing voices that no one else can hear is a bad thing “even in the wizarding world,” it makes no damn sense. She’s been a witch for one year, not nearly long enough to absorb these sorts of tidbits about wizard culture. I believe this was done to reinforce the concept that Hermione is super smart, but it takes so much away from Ron’s personality. By reassigning lines that logically should be delivered by Ron to Hermione it undermines this idea of a distinct wizard culture separate from the muggle world. It also erases the concept of people displaying different types of intelligence (book smarts vs. street smarts), which is a concept kids should definitely be introduced to at a young age. Is Chamber of Secrets completely ruined by these two scenes? No, but this is a great example of the kinds of perplexing changes that are often made when books are adapted into movies. It’s Prince Caspian and Voyage of the Dawn Treader all over again, albeit in a better written package. I feel like I’m going to very quickly run out of superlatives to describe this series. There are eight films to review (obviously I own every one of them) and not enough ways to say they are superb films, and possibly the greatest film series ever made. In terms of consistent standard of quality, anyway. The thing I like about these films is they are telling one large story, but can also be enjoyed on their own. This is never more evident than in the second film of the Harry Potter series, The Chamber of Secrets. There are events that happen in this film that directly relate to the series climax. The audience does not find out about this connection until later in the series, but I really enjoyed that J.K. Rowling has a story to tell and had the idea of how it would end as far back as this second book of the series. When the author knows how their story is going to end, it is very easy for them to get there. I feel like sometimes writers will just get an idea and suddenly it becomes popular and then they have to wing it when people expect the story to continue. A great example of this would be the television series Prison Break. The first season of that show was great, but it never felt like the show should continue past that first season. It felt like the producers were almost surprised they had a good show on their hands and had no idea what to do when a second season was ordered. Thankfully, this is not the case with Harry Potter, J.K Rowling knows exactly where these characters are headed and it is great to be able to join them on their journey. The second instalment of the Potter films picks up when Harry (Daniel Radcliffe) is about to return to Hogwarts School of Witchcraft and Wizardry for his second year, when a house elf named Dobby appears in his room begging him to not return to the school as he is danger. When Harry refuses, Dobby attempts to block Harry from reaching the school. Harry and his best friend Ron (Ruper Grint), eventually reach Hogwarts by flying the Weasley family car there. Once they arrive, Harry realises Dobby may have been right and he should never have come back. There are many threats at school for Harry this year, including a giant snake and a strange diary belonging to a man named Tom Riddle. Harry must find a way to save his friends and destroy this diary, all while also having to negotiate another year of school at Hogwarts. I enjoyed this film, I was surprised to see it came out with a PG rating. The scenes at the end where Harry impales a giant snake are quite gruesome. Thankfully, I am not a child, so did not really care what the rating was. This is more of an FYI for any parents wanting to take their kids to see this film. As with the first film, the child actors are helped along by a fantastic array of experienced British actors. Returning from the first film is Alan Rickman, Maggie Smith and Richard Harris. They are joined for the second film by Kenneth Brannagh as Gilderoy Lockhart. He is a lot of fun as the charming new Defense Against the Dark Arts teacher. I’d have liked to see him return for more of the films, but it was not to be. This film improves on the original film, mostly because the child actors are a year older and have gotten more comfortable in front of the camera.